Over the last decade, assessment of student learning has moved beyond being a topic of discussion solely within the academic community and into the public discourse. Institutions are expected to measure student achievement both to inform and provide accountability to the public, as well as to assure the success of institutional mission. We regularly hear board members ask how they can learn whether students are receiving the quality education the institution promises. What measures will help them understand student achievement? What information should they have to answer important questions about the academic enterprise? In this era of increased demand for accountability in higher education, AGB was interested in better understanding the role governing boards currently play in monitoring policy making related to educational quality. With generous support from Lumina Foundation for Education, AGB launched a two-year project—Governance for Student Success—that emphasizes the role of governing boards, working in collaboration with institutional presidents and chancellors, in helping to achieve the nation’s educational needs. Chief among these needs are increasing access, improving graduation rates, and addressing affordability. 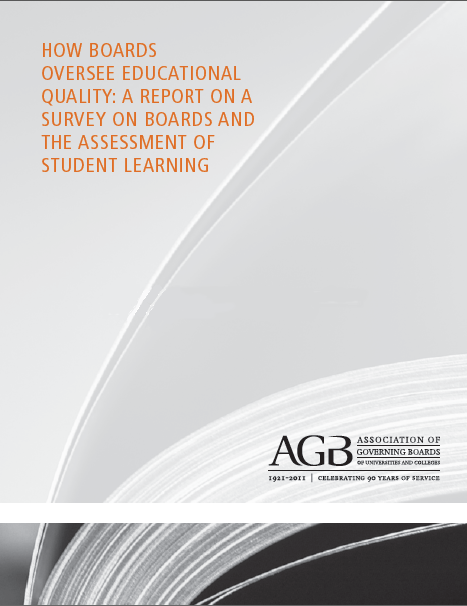 Because significant information about the quality of education can be found in assessments of student learning, AGB sought, through a survey of provosts and chairs of academic affairs committees that resulted in this report, to develop a better understanding of how boards receive information on student learning, and what they do with the information they receive. The survey findings are mixed. While the majority of boards receive some information about student-learning outcomes, they are often unsure of how to respond to or interpret that information. Orientation to the information is relatively rare, and frequently, institutional leaders and board members do not share an understanding of the value boards can bring to discussions on student-learning outcomes and educational quality. Often, boards do not make the link between their financial responsibilities and educational quality. Yet unless boards fully engage in discussions about the assessment of student learning, and understand the implications of that assessment, they will not fully carry out their fiduciary responsibility and add value at the policy level. Boards should not lead such an assessment, just as they should not be overly involved in deciding what to teach or how. But there are ways, highlighted within the report, for boards and administrators to work together more effectively on these central issues that ultimately determine institutional effectiveness. Additional resources on boards and educational quality.